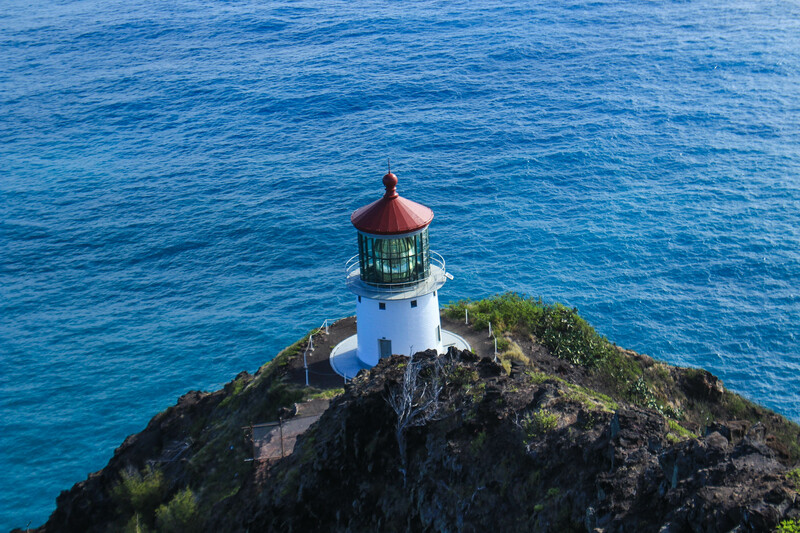 The Makapu’u Lighthouse Trail is a very easy walk, right around 2 miles round-trip, gradually gaining elevation on a wide, paved road which is essentially a highway for tourists. It took us 2 tries to make it to the end. That’s pretty sad for experienced hikers, right? Don’t worry, we have an explanation (excuse): We wanted to hike this because we had a meeting on the Windward side of Oahu, and this was another easy hike with a letterbox that would help us stay out of the hotel a little longer. The day we attempted the hike, it was very hot, and we arrived right around noon with the sun directly above us and not a bit of shade. The blacktop road to the top was also on the verge of being uncomfortably hot, which raised concern for Charlotte’s poor paws. Curtis was walking barefoot so that he would know what she was feeling, and we quickly came to the conclusion that this was not the day for this hike. We needed to have an earlier start to beat both the sun and the crowds. And so we turned around and gave up. The next weekend, we had another meeting on the Windward coast, and this time instead of planning to hike afterwards we left early to hike before the meeting. The trail was still quite busy, but we managed to arrived before the sun hit the pavement. 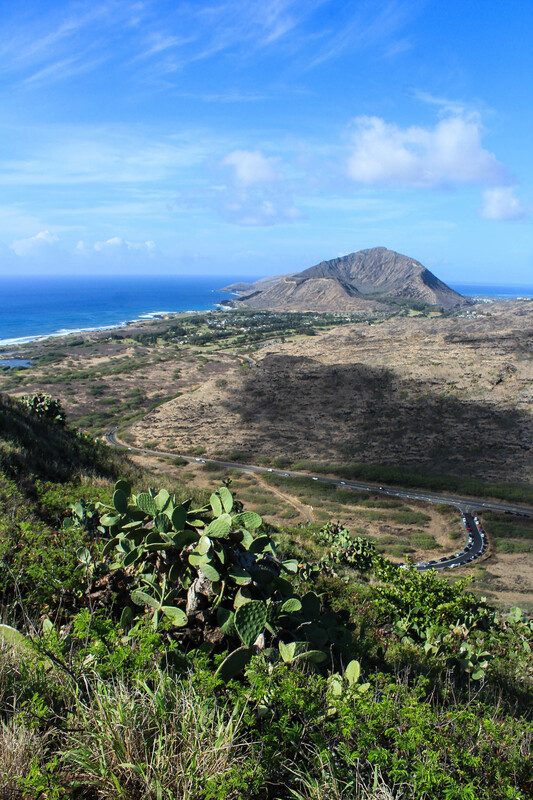 After the first long stretch of road, we came to the first lookout where we could see into the Koko Crater to the West, and we could make out the island of Molokai Southeast of us on the horizon. The road turns and continues going uphill with a few other signs and lookouts, where we read that this is a great place to spot whales during “whale season”. We hope to return to hike this again between January and March, when whale sightings are most common! There’s also a spur trail along the way that takes you down to the lighthouse, as the lookout ends a ways above it. We’ll try that one another time too. 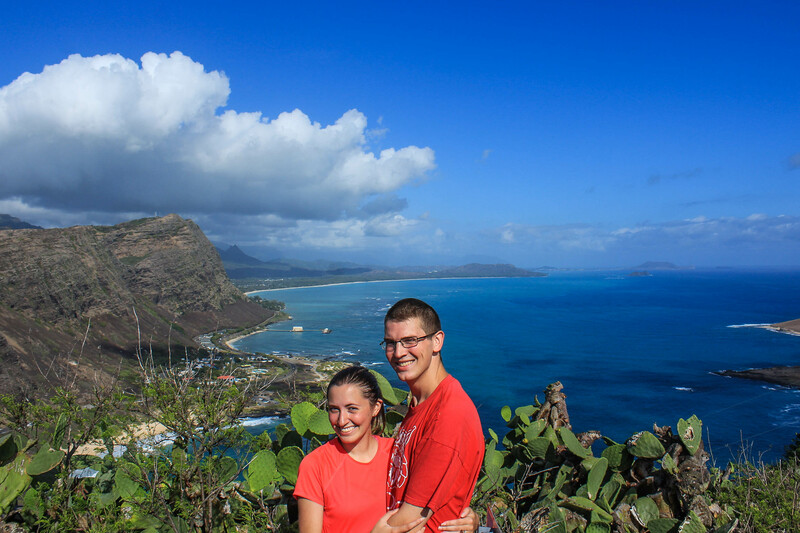 Eventually we reached the end of the paved trail, with a large lookout and amazing view of the ocean with 2 nearby islands, the Windward coast, and the Southern end of the Ko’olau Mountain Range. 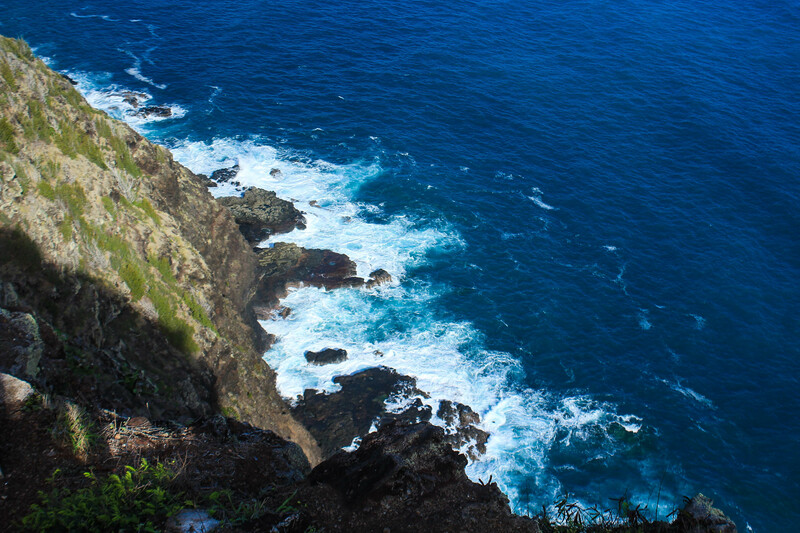 We took in the view and admired the gorgeous shades of blue water, turning into turquoise as it came closer to the shore, and watching the waves crash into the rocks below us. It’s clear why this trail is so popular: it’s a low-cost, high-reward kind of hike. However, being the adventure-hungry folks we are, we decided that stopping here wasn’t enough for us, so we wandered off the paved trail and followed a dirt path that led up to an even higher point, away from all the tourists with an even better view. But our favorite part about this little diversion wasn’t the view — it was the fact that the terrain reminded us so much of the deserts in the Southwest. The ground was dry and rocky, and we were surrounded by cactus-like plants — including prickly pears! I then also realized a huge perk of being in Hawaii: there are no rattlesnakes here! I was hiking a very Southwestern-feeling trail, and I didn’t have to keep my eyes out for snakes! Arizona is still our favorite place we’ve lived, but this might make Hawaii a worthy contender for #2. At the end of the path, we found our second pillbox, which came in handy for auto-timed pictures. One unfortunate thing about these pillboxes is that those who visit them tend to leave behind their plastic bottles, and this one was filled with litter. Of course, we do get a refund for returned bottles, so we filled Curtis’ backpack as much as we could with empty bottles. Next time we’ll bring empty bags to take down even more. If we really committed to this, it could be a great part time job — like making money just for hiking an easy trail and doing a little work to protect it and keep it clean! Once we finished the hike, we drove just a bit further to Makapu’u Beach to sit and watch the surfers, and walk around the rocks. I know we’ve said over and over that we aren’t beach people, but I promise we’re going to be here. I mean, how could we live in Hawaii and not at least try? The beaches here happen to be some of the most beautiful ones we’ve ever seen, so it shouldn’t be too hard to enjoy them.